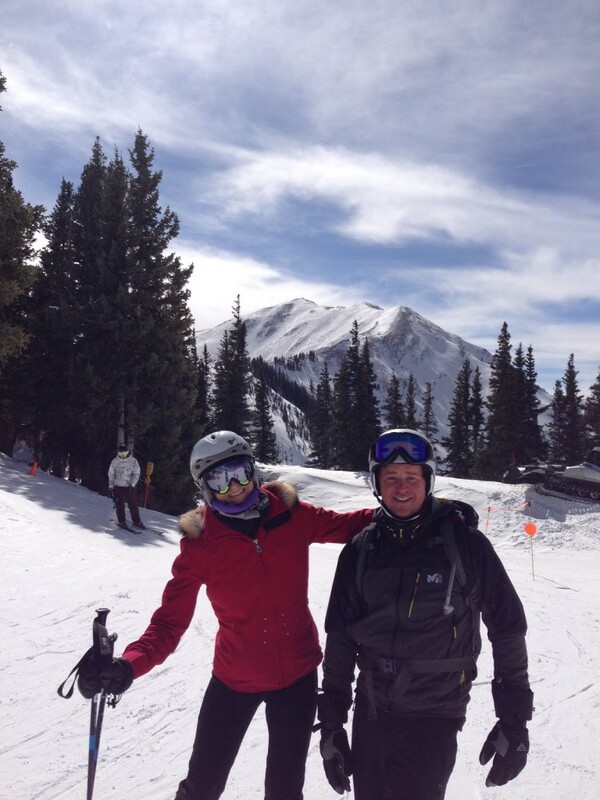 We just spent an eventful President’s Day weekend with friends who live in Aspen village. This was a family trip so we avoided the late nights at the Caribou Club, and instead were fresh and ready every morning to put in full ski days while the kids were at ski school at nearby Buttermilk Mountain. 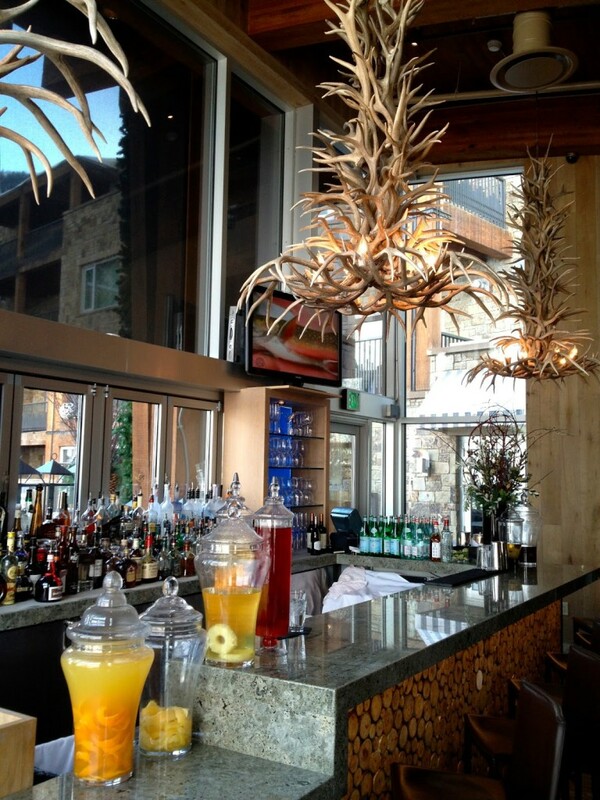 As you can tell from my Telluride post, I love big lunches, and on our first day, we chose Il Mulino**, located at the base of Aspen (Ajax) Mountain near the gondola. This New York City icon opened this location in 2009 and occupies a light-filled space with these three incredible horn chandeliers suspended above the bar. 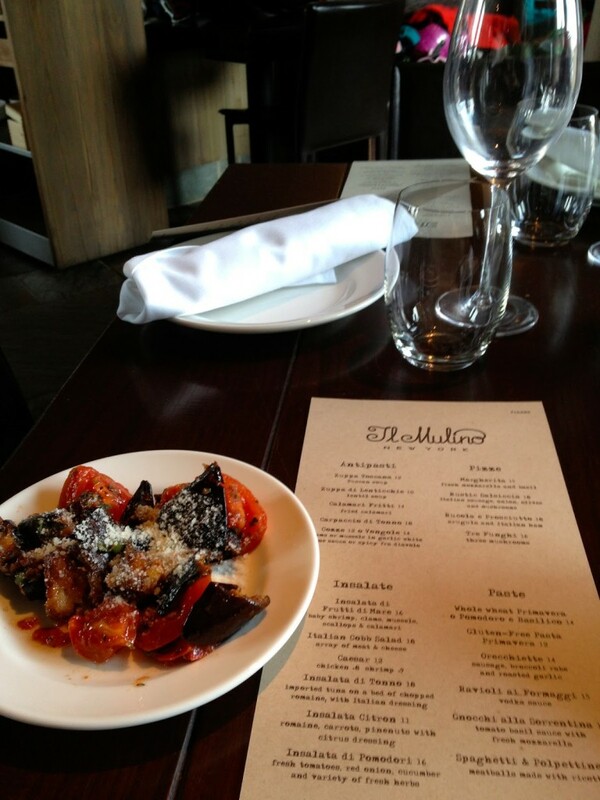 The service was spectacular as we were promptly served a complimentary appetizer of Eggplant Caponata: grilled eggplant and tomatoes, with scallions, garlic, basil and Parmesan cheese, all marinated together in olive oil. It sounds so simple, but was the perfect intro to lunch, so we asked for more while sipping on Prosecco and contemplating what to order. We decided on the calamari fritti, the lentil soup, the fish special, grilled salmon atop a bed of sauteed kale, and the cheese ravioli (made in-house, of course) in vodka sauce. We rounded it off with a great bottle of La Court Barbera d’Asti, and we were officially done for the day. 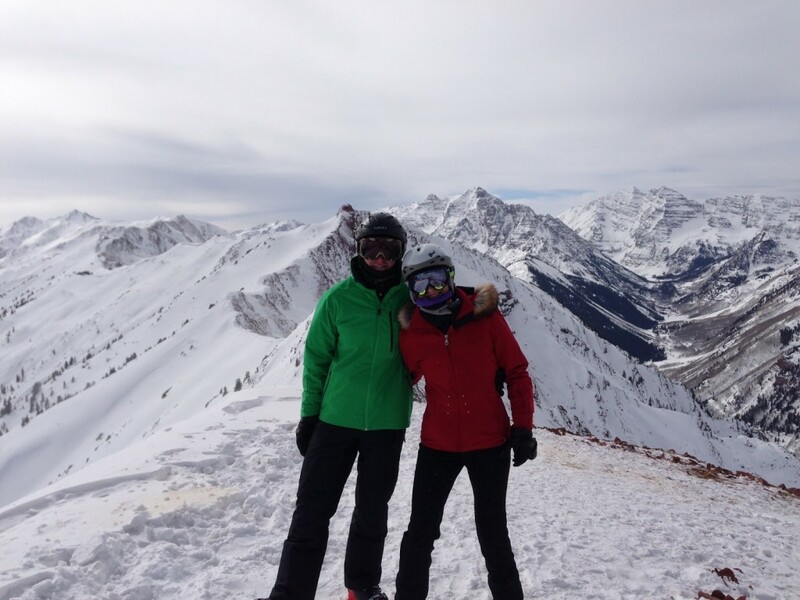 On our second day, we drove to Aspen Highlands to check out the famous double diamonds off the Deep Temerity lift. 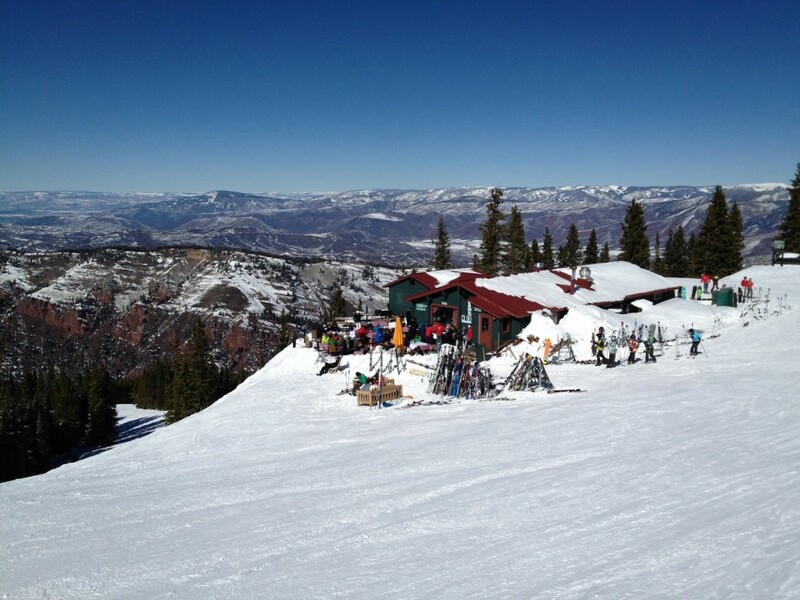 I had not made reservations at the equally famous Cloud 9 restaurant (at 10,900 feet off the Cloud 9 lift), but we arrived early and were able to obtain a couple of chilly seats on the patio, which we were told is first-come, first-serve. It was a very windy day, so to warm up, we ordered a couple of glasses of gluhwein, a warm, spicy traditional German drink made from red wine. One of the most fun things to order at Cloud 9 is the raclette, a Swiss dish of cheese by the same name that is heated in front of a fire and scraped over potatoes, gherkins, dried meats and pickled onions. 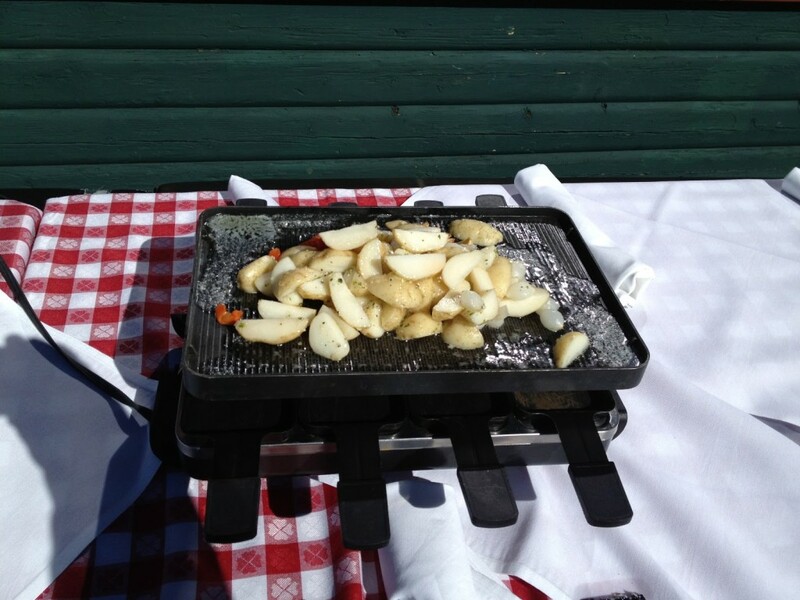 A modern way of serving the dish is with an electric table top grill with small pans, shown here. In this manner, the cheese is brought to you pre-sliced, and you heat it on the small pans under the main grill of sauteed potatoes. However, the raclette must be ordered 24 hours in advance, so we settled for the prix fixe menu, which included the soup of the day (vegan tomato) and a choice of entrees ranging from local rainbow trout to braised beef short ribs and duck confit. 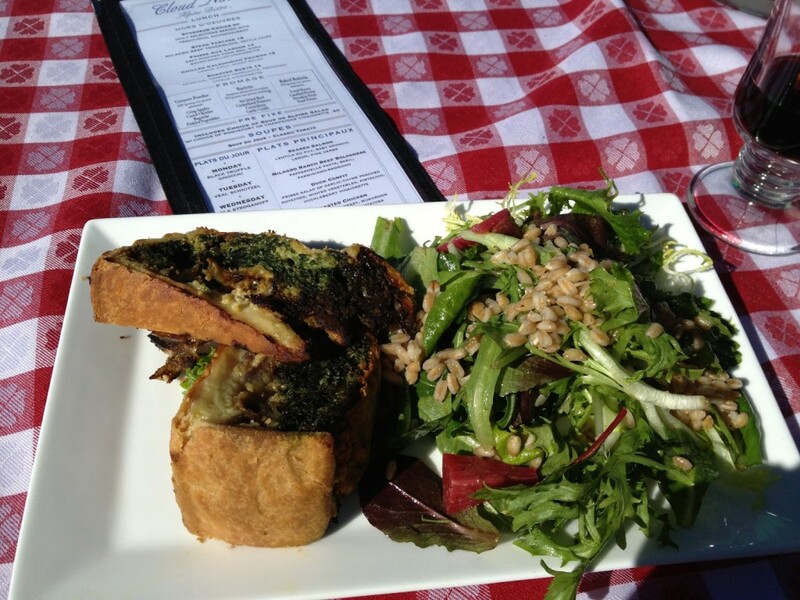 As I had filled my quota of duck confit in Telluride, I opted for the Cloud 9 quiche of carmelized onions, gruyere cheese and spinach, while Hubby had roasted chicken with mushroom ragout. Below is a photo of the quiche. To do Cloud 9 in style, you must hang out until about 1:30 or so, when they crank the house music and the clientele dances on the wooden tables, ski boots and all. We have done that, and it is great fun, if a bit ugly. But we had to save that for another time, as we had decided to hike the Highland Bowl first thing the next morning. What did this entail? 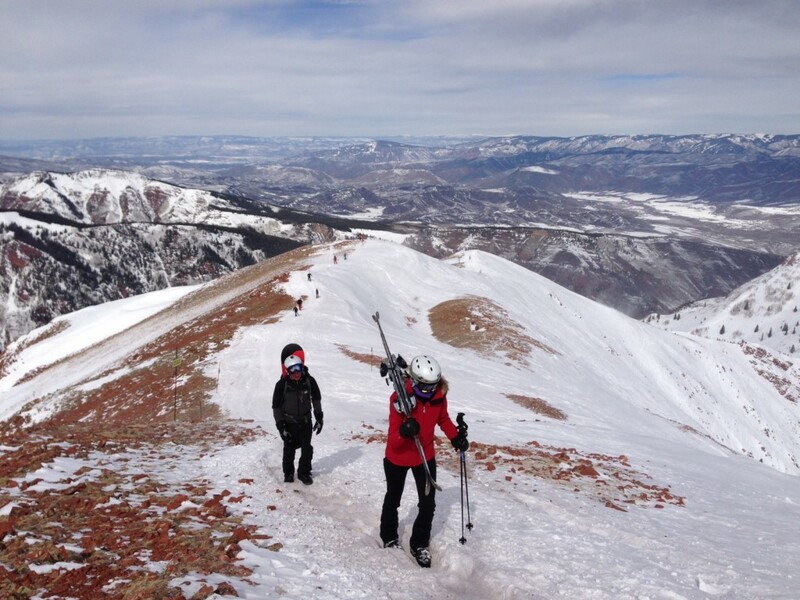 We took the Loge chairlift to the top of Loge Peak at 11,675 feet, and took off our skis to wind our way 700 feet up to 12,392 feet. You ask why one would do such a thing? For unparalleled views of Maroon Bells? On a clear day, yes. To ski some of the best and steepest runs on the mountain? Possibly. Bragging rights? Most definitely! To the left you will see us at the starting point of the hike, with Highland Peak in the background. Being out-of-towners (and rookies), we did not have the ski straps that locals use to carry skis on their backs, thereby freeing your hands. So we threw our skis over our shoulders and trudged on. (Note: we did not take the Snow Cat that takes you up 1/3 of the way.) It was extremely windy, and after being knocked to my knees a couple of times by the wind, our gracious host helped me carry my skis up Heart Attack Hill (aptly named), and after 45 minutes we made it to the top. Yes, the views and the skiing were worth every gut-wrenching step! But the deck was closed due to the wind!!! So, I had to settle for a mimosa (or two) at BB’s Kitchen, a wonderful brunch spot in town. We did not have a bad meal in Aspen, and I will end by recommending our highlights: the Jerome Burger at the J Bar in the historic Jerome Hotel, a must-see for the pressed-tin ceiling, 75 percent of which is said to be original; the braised artichoke heart bruschetta and the oven roasted striped bass at Ellina, the quinoa veggie bowl for breakfast at Peaches Corner Cafe. 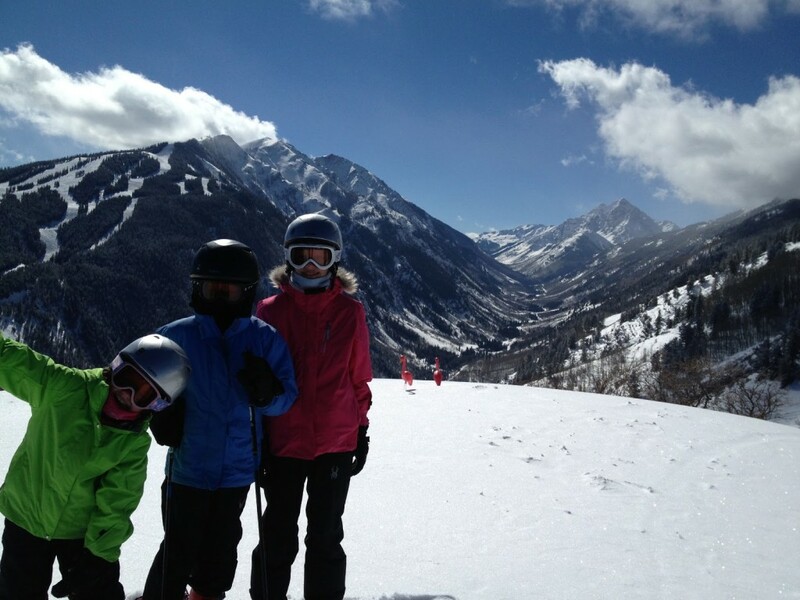 But the best part of the trip…skiing with our three monkeys and a view of the spectacular Maroon Bells. 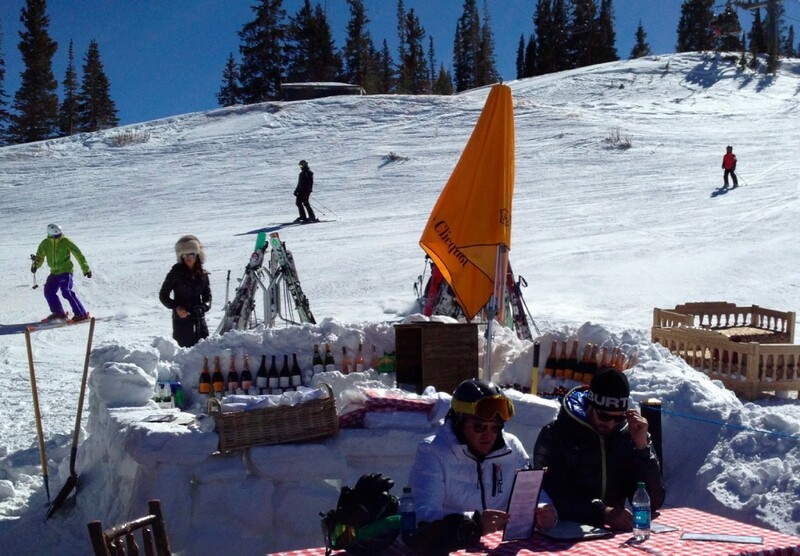 ** Update: Sadly, Il Mulino Aspen closed its doors and is no longer in business :(.